The workers of Sheraton hotel, Baghdad, went on strike for two days last week demanding their overdue salaries and other unpaid benefits. 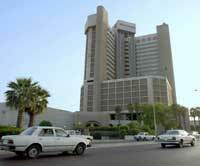 The strike was led by the General union of the tourism and hotels' workers, inside the building of Sheraton hotel - Baghdad. The demands of the workers focused on paying the overdue salaries and arrear unpaid benefits of the holidays which amount up to 200.000 Iraqi Dinars (equivalent to 140 US$) in addition other arrears. There were 250 workers which took part in the strike that continued from Sunday till Monday, where the workers gathered daily at about 10:00 am. The administration started negotiations with the delegation from the workers represented by Zamil Abood and Ayad Fadhil, both of whom are members in the executive bureau of the tourism and hotels union. The delegation presented the workers demands to the administration, which agreed to these demands. Consequently, the workers ended their strike after reaching an agreement with the administration. The salaries of the workers of Sheraton, Merdian, and Baghdad hotels and many other hotels were frozen because of the limited business and occupancy of the hotels as result of changing them into military controlled zones and the concert walls built around.